So the first thing I should tell you is that I finally watched Pitch Perfect and OH MY GOSH YOU WERE RIGHT, YOU WERE ALL RIGHT. It is amazing and everything a movie should ever be, EVER. There are all manner of things going on at Chez Riley these days, mostly related to the five week old baby that now calls herself a part of the family. I’m still on maternity leave, which has been nice, except that whenever I am at home for large chunks of time, I inexplicably turn into the human equivalent of a sloth, lounging about and moving verrryyyy slooooooooooowwwllyyy and collecting insects on my furry skin. 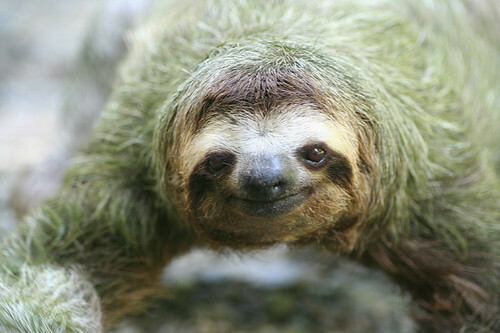 And if I were ACTUALLY a sloth, I think I’d like to be this one. Is he green? So what I’m saying is, maternity leave is super fun because I get to play full-time Mom, but I also tend to do more Today Show watching and less house cleaning, which means my husband often comes home to a wife who looks a whole lot like she did when he left that morning, and oh look, there are more dirty dishes in the sink. This is why I work, people. The more time I have, the less I do, the less I want to do. It’s a vicious cycle of Not Doing Anything. I’m like one of the pirates who don’t do anything. What do you mean, you can tell we have small children? OH! Okay so I started writing this new book. I described it on the Twitter as having a similar tone/feel to Anna and the French Kiss, but with gangsters. So there’s that. I’ve only written about 3,000 words so far, but I’m so excited about what I’ve got. I’m using a TOTALLY different technique this time–I’m actually writing the book OUT OF ORDER, which has always seemed a little cray-cray to me, but for this story, well…it kind of makes sense. So I’ve written the opening scene, and Scene #2, and then Scene #15 or something like that. And I’m really taking my time with them because there’s no hurry at all, no deadline, nothing. So I’m writing a scene and then revising it several times before I move on. Also, for the first time EVAH, I have chosen specific people as my inspiration for these characters. Well, the two main ones, anyway. So it’s been really fun to take my time with the story, actually create a first draft that won’t make me stabby when it comes to revision time, and, y’know, not be a CRAZY PERSON. Also, those pictures look pretty serious, but I’m hoping it’ll be a funny-ish book. At least in some parts. Yes. A funny book about gangsters. It also takes place in Northern Ireland, because 1) apparently I struggle to write a book that isn’t set somewhere in Europe, and B) I worked at this soccer camp in NI for a summer back in like 2002, and I’ve been DYYYYYING to use the house I stayed at as the setting for one of my stories. …and yeah, sorry, I totally just dropped the “I worked at a soccer camp in Northern Ireland” nugget*, which deserves an entire blog post of its own, but sadly there is no time, Grasshoppers. Well, no, I’m really not. I can tell you I’m writing a funny book about gangsters that takes place in Northern Ireland, and then you and I can both write a book based on those facts, but guess what? Our books will be nothing alike in any other respect. What’s that? You need a baby photo before I leave you? An early smiler, she is. Alright, ladies and gents…I do believe my work here is done. Happy mid-February to all, and I’ll see you next time.